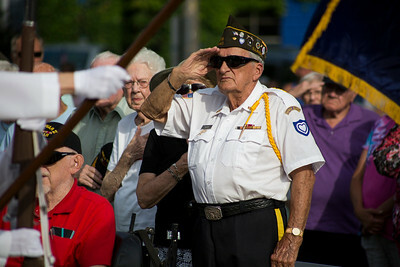 Mike Greene - For Shaw Media WWII Veterans and attendees salute the flag during McHenry's seventh annual event celebrating the end of World War II Sunday, August 14, 2016 at Veterans Memorial Park in McHenry. The annual event included swing music by Bill's Little Big Band, Military Honor Guard Salute with "Taps" played by 18 Buglers as well as a 21 white dove release. 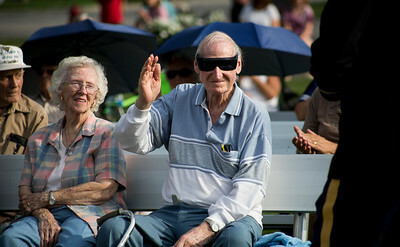 Mike Greene - For Shaw Media WWII Veteran Eugene Miller, right a 9th Air Force Corporal, raisees his hand to be recognized while sitting with his wife Clarice during McHenry's seventh annual event celebrating the end of World War II Sunday, August 14, 2016 at Veterans Memorial Park in McHenry. The annual event included swing music by Bill's Little Big Band, Military Honor Guard Salute with "Taps" played by 18 Buglers as well as a 21 white dove release. 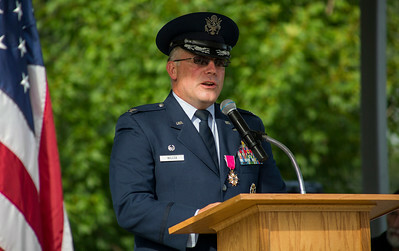 Mike Greene - For Shaw Media Retired USAF Colonel Craig Wilcox speaks during McHenry's seventh annual event celebrating the end of World War II Sunday, August 14, 2016 at Veterans Memorial Park in McHenry. The annual event included swing music by Bill's Little Big Band, Military Honor Guard Salute with "Taps" played by 18 Buglers as well as a 21 white dove release. Mike Greene - For Shaw Media Doves are released during McHenry's seventh annual event celebrating the end of World War II Sunday, August 14, 2016 at Veterans Memorial Park in McHenry. The annual event included swing music by Bill's Little Big Band, Military Honor Guard Salute with "Taps" played by 18 Buglers as well as a 21 white dove release. 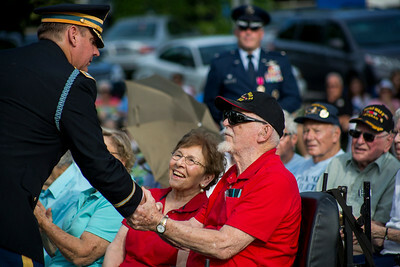 Mike Greene - For Shaw Media WWII Veteran Army Sergeant Joe Vokaty, right, shakes hand with Army Lieutenant Colonel Lee Lexow while receiving a coin commemorating his sevice during McHenry's seventh annual event celebrating the end of World War II Sunday, August 14, 2016 at Veterans Memorial Park in McHenry. The annual event included swing music by Bill's Little Big Band, Military Honor Guard Salute with "Taps" played by 18 Buglers as well as a 21 white dove release. 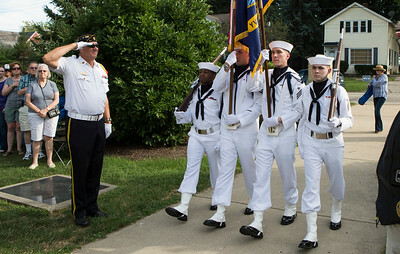 Mike Greene - For Shaw Media The colors are presented by members of the Navy Color Guard at Captain James A. Lovell Federal Health Care Center during McHenry's seventh annual event celebrating the end of World War II Sunday, August 14, 2016 at Veterans Memorial Park in McHenry. 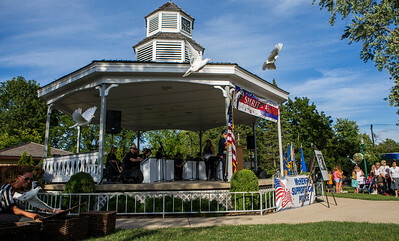 The annual event included swing music by Bill's Little Big Band, Military Honor Guard Salute with "Taps" played by 18 Buglers as well as a 21 white dove release.